Chris Wolff of Fort Collins has made countless one-of-a-kind pieces of pottery over the years. Have you ever wandered through an art fair or exhibit and marveled that there could be so many variations of a mug . . . or a pot . . . or a pitcher? Besides their boundless imagination, artisans have an amazing number of down-to-earth choices for letting their creativity take form in clay. 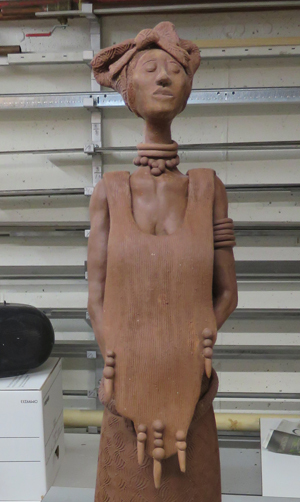 My education in ceramics began unexpectedly on the Fort Collins Studio Tour late in June. 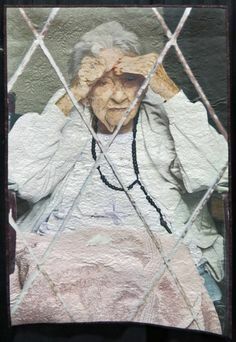 If you read my post on August 6, you know about my visit with Susan Sternlieb, who showed me how a well-flattened slab of clay can slump to become a bowl. Later on the tour I met three artisans who continued my education: Chris Wolff, Cindy O’Neill, and Heather Bartmann. Through them I began to grasp how many choices go into each one-of-a-kind ceramic piece. For her series of African women, Cindy O’Neill uses brown clay that turns black in the heat of the kiln. Clay seems like the simplest of substances, but when it comes to ceramics, that just isn’t the case. 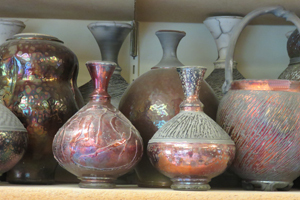 Potters choose from many different types of clay that vary in elasticity, texture, and their reaction to glazes. Not to mention color, such as cream, tan, brown, and terracotta. 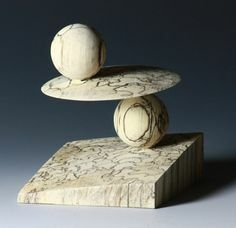 Lately Chris Wolff has been working mostly with stoneware clay; it looks gray when it’s raw but turns white in the kiln. He likes it soft and orders it from a California company that prepares it especially for him, one ton at a time. A ton of clay . . . The idea boggled my mind until Chris pointed out I had walked right by the better part of a shipment without even noticing. Clay is so dense, a ton can fit into a corner of his studio, stacked in boxes of 50 pounds each. 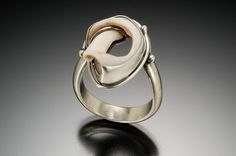 Working with clay takes patience and flexibility, Heather Bartmann told me. Sometimes you just don’t know how a piece will turn out until you get started. Sometimes things go differently from what you thought, or you make a mistake, and you have to figure out what else you can do with that piece. Sounds like life, doesn’t it? The first potter’s wheels I’ve ever seen in person are in Heather’s basement, where she and Cindy O’Neill set up their 2 Clay Chicks Ceramics studio. I had seen potter’s wheels in pictures, but these took me totally by surprise. They’re mounted on tables so low you could never get your knees under them. The tabletops are narrow and rounded so you can sit close with a leg on either side of the wheel. On the floor is a pedal to control how fast the wheel turns. 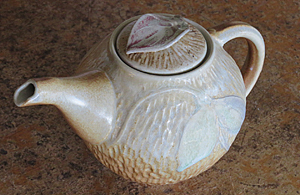 Heather Bartmann threw the body, spout and handle of this teapot separately on the wheel. She then “pulled” the handle and sculpted the leaf on the lid. Wheel-thrown. Now there’s an interesting potter’s term. The potter centers the clay on the platter-sized wheel, presses a hole in the middle, and pulls the clay up into the desired shape. No throwing happens – as we usually understand the word, anyway. 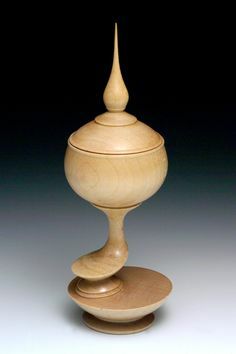 In an article by Dennis Krueger in Ceramics Today, I read that the word throw comes from the Old English thrawan, which meant to turn or twist. Now it makes sense . . . There are many more ways to shape clay; it can be paddled, pushed, pulled, stretched, sculpted, and cut, to name a few. 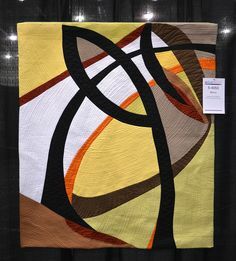 It can even be thrown on a wheel first and then altered in any of those ways. That’s how Heather created the bowl pictured below. 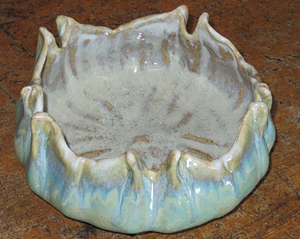 For her gourd bowl, Heather Bartmann purposely chose a glaze that would run in the kiln. An additional glaze added to the effect. Artisans’ choices get even broader when they start selecting glazes. 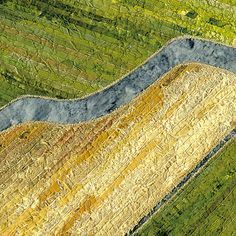 They consider not only color and sheen but also how a glaze reacts to heat and the clay they’re using. With some exceptions, potters apply the glaze after the completed clay form has already gone to the kiln once. In that first round of heat, the clay has become strong and hard, but it’s still porous. With the glaze on, it returns to the kiln where it will become even hotter, until both the glaze and the clay vitrify – become like glass, Heather explained. Vitrify. Seven letters, including two i’s and a v . . . The Scrabble player within is going to make me hang onto this one. 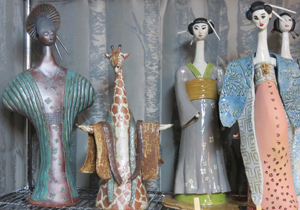 Cindy O’Neill reveals her interest in other cultures through her ceramic figures. What happens as ceramics vitrify depends on the kiln. In an electric kiln there’s plenty of oxygen to react with chemicals in the glaze and clay. In a gas-fired kiln, oxygen decreases and carbon becomes the important element. As a result, the same glaze may come out a completely different color. In an outbuilding at 2 Clay Chicks Ceramics, one kiln runs on electricity, the other on natural gas. Bulky and black, the gas kiln reminds me of a small town’s bank vault in a western; its door swings the same way, too, and requires a good strong pull. Cindy and Heather keep watch on what’s happening inside the kiln through a glass-covered hole. A vent on top allows them to control how much carbon builds up, affecting the final look of their work. 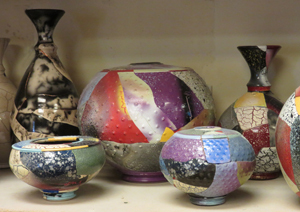 At his studio on the other side of town, Chris uses his electric kiln for functional ware. But he also has a raku kiln, propane-fired, for decorative pieces. Compared to the gas kiln at 2 Clay Chicks Ceramics, his raku kiln looks humble indeed. But how I would love to see Chris remove a ceramic vessel, burning hot, and place it with his long tongs in a bin of sawdust . . . How I would love to see the sawdust burst into flame and then watch Chris put a metal trash can over it to put the flame out and let the fire smoke . . . So many choices these artisans have – no wonder they can keep us in awe. If you enjoyed catching up with me on the Fort Collins Studio Tour these last four weeks, consider putting the Loveland Art Studio Tour on your October calendar. This year it runs Saturday and Sunday for two weekends, October 11-12 and October 18-19. 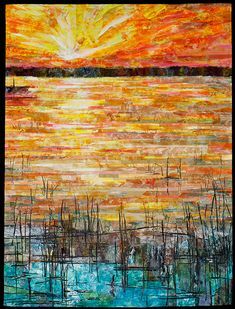 In the meantime, you can catch Cindy and Heather next week on September 5 during First Friday, the gallery walk in Fort Collins. They’ll be exhibiting their work above the Museum of Art on College Avenue, in the office of Legacy Financial. Check out their website, too, at 2 Clay Chicks Ceramics. You can see Chris’s work on First Friday or anytime at Trimble Court off Old Town Square. He will be there himself on September 1 and again on September 3 from 10 a.m. to 2 p.m. Visit his Facebook page, too, for pictures of his work. And don’t miss his YouTube demonstration of throwing clay on the wheel — it’s amazing. Let me know if you agree. Click “reply” at the top left of this post. This entry was posted in Ceramics and tagged Chris Wolff, Cindy O'Neill, clay, Fort Collins Studio Tour, glaze, Heather Bartmann, kiln, raku wheel-thrown on August 27, 2014 by Sally. Thank you very much for your feedback, Joan. Working on this blog has been a source of joy for me, and delighted readers make the experience complete.